In round 8 of the Biel International Chess Festival, Alex Onischuk rebounded into the lead (along with Radjabov) with a sparkling win over Boris Avrukh. 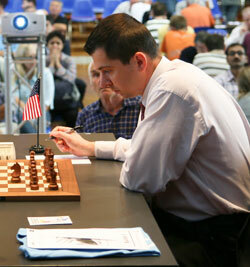 The leader prior to the round, Magnus Carlsen, conveniently lost to Loek Van Wely. Today Alexander is playing Motylev for 1st place. 27.Qxe7 is a beautiful and unusual in-between move. (He needed to have this move, because 26.Rxd1 Qxd1 27.Kh2 Qd6 would be good for Black.) Black cannot save the rook on c1 and prevent Bh6-Qf8# mate at the same time. Avrukh found the only move, Rh1+, but even here, White still had a winning edge.